Elect Cert Ltd are committed to protecting your privacy and shall only use the information you provide on this page to respond to your enquiry. Rolec EV manufactures a range of EV charging points which have been specially designed for commercial locations, including restaurants, offices, factories, warehouses, car parks, etc. WallPod: EV CommercialCharge – A low-cost, entry level commercial charging unit, designed to offer full Mode 3 fast charging to every Electric Vehicle (EV) on the market today. This unit has been specifically designed for charging EVs in commercial locations such as offices, factories, restaurants, hotels, sports venues, etc., and is available in J1772 or IEC 62196 tethered cable, or IEC 62196 socket, versions - as well as in IEC 62196 SuperFast (3phase, 11kW/22kW) tethered lead and socket versions. SecuriCharge: EV Wall Unit – A robust, heavy duty, vandal resistant EV charging unit specifically manufactured for exposed locations. This versatile unit charges via its IEC62196 (Type 2) Mode 3 charging socket(s), which are securely locked away when not in use. Ideal locations include hotels, car parks, offices, factories, warehouses, restaurants, stadiums, leisure centres and retail and commercial premises. It is available in 1way or 2way, 16amp (3.6kW) and 32amp (7.2kW), FastCharge versions c/w hatchlock, built-in overload & fault current protection - as well as a SuperFast 1way version featuring 3 phase 11kW or 22kW charging. SecuriCharge: EV Wall Unit (Coin/Token – PAYG) - Same as the SecuriCharge unit described above, but offering a simple pay-to-charge solution via a coin or token payment system. BasicCharge: EV Pedestal - Brother to our world-leading Classic utility pedestal, which now boasts over 110,000 sold worldwide, this mass produced, tried and tested pedestal is, we believe, the most affordable and adaptable EV charging pedestal in the world. It offers either 1way or 2way IEC 62196 Type 2, Mode 3 fast charging socket(s), c/w hatchlock, built-in overload & fault current protection. Also available as a SuperFast unit in a 1way or 2way IEC 62196 version offering 3 phase (11kW or 22kW) charging. AutoCharge: EV Pedestal - Heavy duty, hard wearing pedestal designed and manufactured for commercial environments. This versatile future-proof unit is available in 1way or 2way, Type 2, Mode 3 IEC 62196 FastCharge or SuperFast format, c/w hatchlock facility, built-in overload and fault current protection. AutoCharge: EV Pedestal (Coin/Token – PAYG) - Same as the AutoCharge unit described above, this pay-to-charge pedestal incorporates a payment system operated by either coins (currency) or unique tokens. EV Charge Online - Revolutionary public facing EV charge point management system which enables all EV drivers to simply pull up to a charge point and, using their mobile phone, tablet or in-car connectivity, login to the charge point and pay on the spot for its use. Provides unrestricted and open access to all EV drivers via a pay-as-you-go charging solution without having to commit to joining any specific network - therefore avoiding unnecessary fees and connection charges. Hosts do not have to pay license fees and can have a charge point (and revenue stream) installed and operational quickly and easily, just by providing an electricity supply. Can also be quickly and easily retro-fitted into existing public facing charging pedestals manufactured and installed by other companies. 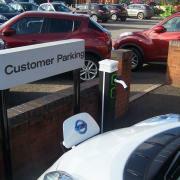 EV GroupManager – This has been designed to provide a privately managed RFID/computer controlled multi-point EV charging system/network. • Ideal for fleets, businesses, clubs, lease companies, housing developments, etc.